520 Beacon is located on the north side of Beacon, between Massachusetts Avenue and Charlesgate East, with 518 Beacon to the east and 526 Beacon to the west. 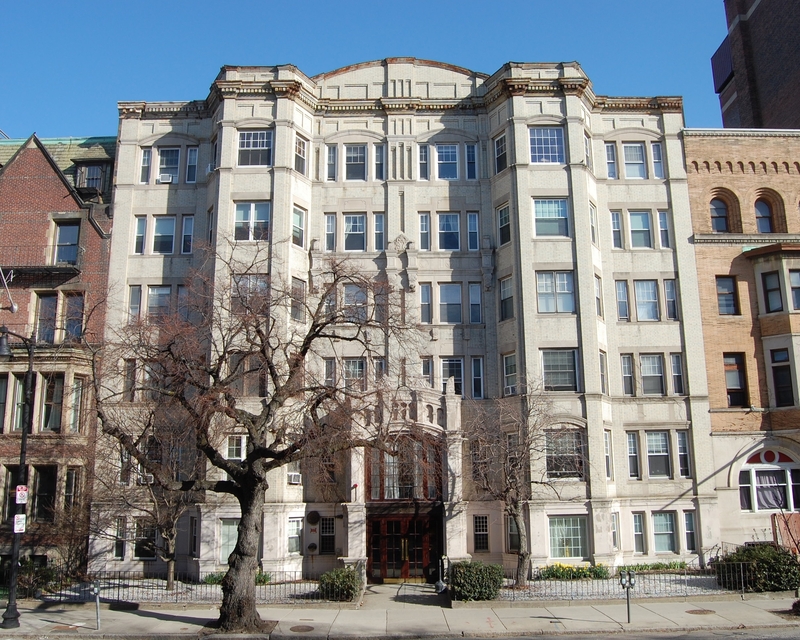 520 Beacon was designed by Frederick Albert Norcross, architect, and built in 1912-1913 as a 29-unit apartment house, the Van Cortland, for Frederick E. Johnston, a builder and real estate dealer. Frederick Johnston purchased the land for 520 Beacon on May 2, 1912, from Michael F. Culliney, who had purchased the land in two transactions: a 25 foot lot to the west on May 1, 1912, from George H. Shattuck, and a 53 foot lot to the east on April 15, 1912, from William Simes. George Shattuck and William Simes both purchased their land on June 2, 1887, from the Boston and Roxbury Mill Corporation. William Simes’s lot originally had been 81 feet wide; he sold the eastern 28 feet in October of 1888 to Mary Eliza (Farwell) Ayer, the wife of Dr. James Bourne Ayer, who had 518 Beacon built on it. Click here for an index to the deeds for 520 Beacon. 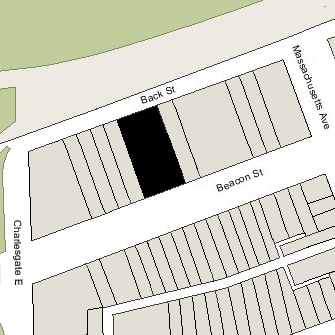 On February 24, 1890, the owners of the land on the north side of Beacon between Massachusetts Avenue and Charlesgate East had entered into an agreement limiting (until January 1, 1905) the depth of any new buildings to 90 feet from the north line of Beacon (with bays and other projections limited to extending another 5 feet), and limiting the height of stables and other ancillary buildings further north to no more than 12 feet in height. The agreement probably was prompted by construction of The Austerfield at 7-9 Massachusetts Avenue (502 Beacon). It was the only building on the block and its north façade extended to Back Street. On March 29, 1912, the owners of property at 506-532 Beacon joined in a new agreement reinstating the restrictions contained in the 1890 agreement, which had expired in 1905. Although many of the lots had been developed by that time, there remained vacant lots at 510 Beacon, 514-516 Beacon, 520-522-524 Beacon, and 534 Beacon. The agreement probably was prompted by the impending construction of the Van Cortland at 520 Beacon. Although dated before Michael Culliney owned the land at 520-522-524 Beacon, the agreement was not recorded until May 2, 1912, and he signed as owner of the three lots before conveying them to Frederick Johnston. The Van Cortland was completed in 1913 and the first residents had taken up occupancy by the 1913-1914 winter season. In addition to the eleven residents listed in the 1914 Blue Book (with the building called the Van Courtland), twenty-four doctors also were shown as maintaining their offices there. On June 1, 1914, 520 Beacon was purchased from Frederick Johnston by Lydia (Wright) Pearson Story Redfield, the wife of Tyler Longstreet Redfield. He was co-owner of a printing company in New York and published the monthly publication, Newspaperdom. They lived in Greenwich, Connecticut. On October 13, 1923, 520 Beacon was acquired from Lydia Redfield by Cora B. (Jenks) Warner, the wife of Frederick W. Warner, a civil engineer. They lived in Newton. By the mid-1920s, 520 Beacon appears to have become primarily medical offices. On November 3, 1933, the Fitchburg Savings Bank foreclosed on a mortgage it held on 520 Beacon and took possession of the property. On November 15, 1933, Sumner Forbes, a mortgage dealer, purchased the property from the bank, and on November 16, he conveyed it back to Somerset Associates. On September 30, 1949, 520 Beacon was acquired from Somerset Associates by 520 Beacon Street, Inc. (Isabel T. Stewart, president). The property changed hands and on June 19, 1958, was acquired by Kenneth Leigh Rodgers and his wife, Cornelia W. Rodgers, of Brookline. He was a real estate developer. In January of 1959, he applied for (and subsequently received) permission to convert the building from 29 medical suites into 35 residential units (34 apartments and a janitor’s unit). On September 15, 1965, 520 Beacon was acquired from Kenneth and Cornelia Rodgers by Theodore A. Green and Sydney Davis, trustees of the Anchor Realty Trust. On January 29, 1974, the Cambridgeport Savings Bank forclosed on a mortgage given by the Anchor Realty Trust and sold the property back to Kenneth Rodgers. On April 11, 1974, 520 Beacon was purchased from Kenneth Rodgers by Robert A. Keezer and Felix D. Paige, trustees of 520 Associates Trust. On July 17, 1974, 520 Associates Trust converted property into 34 condominium units, the 520 Beacon Condominium.